The UBC Physics and Astronomy Outreach Program offers professional development workshops 1-2 times a year. These workshops are designed for both physics teachers and for teachers of all sciences. To receive an email when registration opens, sign up here. 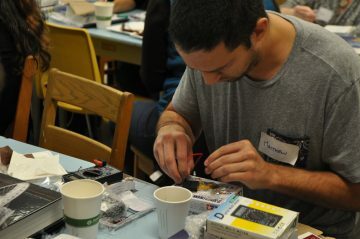 We will be running a teacher Pro-D workshop on Friday, May 17th, 2019 with a focus on introducing circuits to students by playing and making. This workshop will cover topics of circuits, voltage, current, and resistance that are part of the BC Grade 9 Science Curriculum, but all teachers who are interested in learning basic electronics are welcome, as some activities would be of interest and appropriate for Grade 4-7 students. The cost of the workshop is $60.00 (discount for teacher candidates available), which will cover the cost of a take-home kit for the teacher, supplies for hands-on activities, coffee, and lunch. Teachers who complete this Pro-D will also be eligible to borrow the “Lend an Experiment” (LEx) kits we put together to use with their own classes. 10:45 – 12:00 Measuring voltage, current, and resistance using a multimeter. 13:00 – 13:30 Hands-on projects with circuits: making a tricolour flash light. Want to visit more places on UBC campus? The lack of funding to purchase supplies for hands-on activities is a significant barrier for teachers to teach physics and climate change in their classrooms. A new program we are starting this year is “Lend an Experiment”– 25 hands-on kits will be assembled and put into boxes for local teachers to borrow. Teachers attending this Pro-D event will be eligible to borrow LEx boxes for us in their classrooms; those from Vancouver Downtown Eastside will receive priority in borrowing the LEx kits. We would like to thank Pacific Institute for Climate Solutions and other donors for their generous support for the development of LEx kits and relevant educational materials.